It’s made of the finest Italien steel available. The newest generation of super light high-end alloy. modern steel absorb bumps and vibrations on the road without a problem. as the steel frame offers extraordinary rigidity. or it’s characteristics as carbon or aluminium does after some years. it’s just steel and it will out last all other materials. which is the perfect base to build up a high performance road bike. experience from building frames for many big Italian names in cycling history. Now it’s time for your frame! Every AURORA “Borealis HSS” is custom made to order, based on the buyers measurements and individually numbered. Please get in touch with us before buying and provide us with your information. We are happy to assist you and build the perfect frame for you. Taking inspiration from the famous and highly skilled frame builders from Japan. Harada-san of Samson, Tanaba-san of Kalavinka, Yamaguchi or Nagasawa just to name a few. Most of them studied frame building under Italian Master frame builders back in the days. Their work and craftsmanship is pure art and second to none. 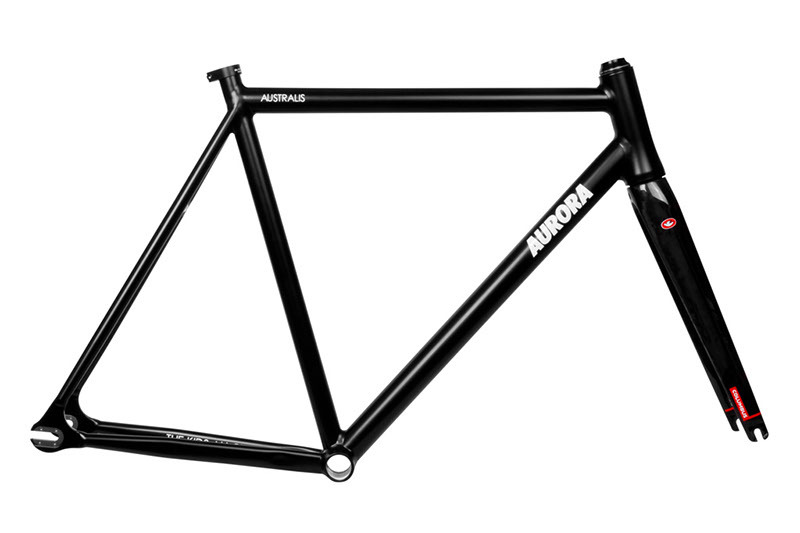 The AURORA “Australis Keirin” steel track is a celebration of classic steel track frames. It’s made of the finest Italien steel available. The Columbus Spirit Keirin Tubing. A special tubing made for only one purpose – track performance. Even with this classic look, it still is a modern, durable and light high-end material with all advantages a modern steel tubing offers. Our AURORA “Australis Keirin” steel track frameset features a classic track geometry with steep angles, tight clearance and a short wheelbase to achieve a sharp and responsive feeling on the track and also on the streets. 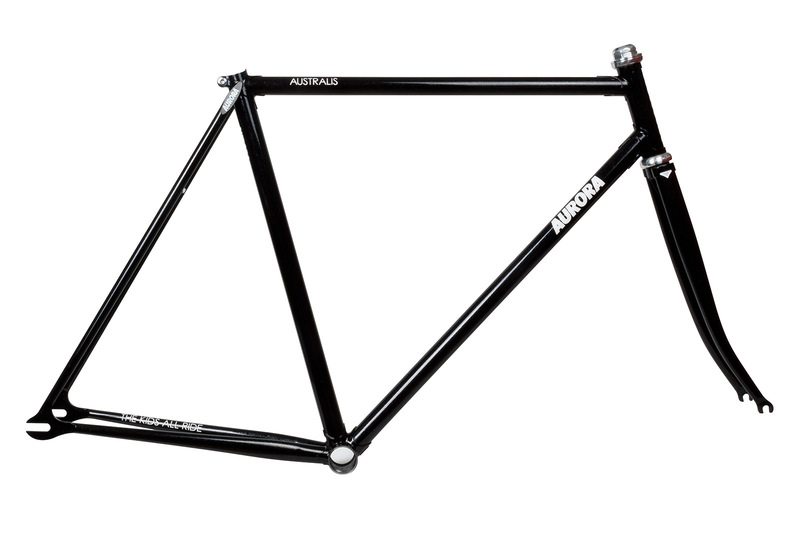 The AURORA “Australis Keirin” is a luxury steel track frameset which is the perfect base to build up a classic track machine. Beautifully lugged and with subtle engravings. The frame is made to order by a Italian master framebuilder, who put’s in all his year-long experience from building frames for many big Italian names in cycling history. Now it’s time for your frame. – Frameset weight: ca. 2400 gr. 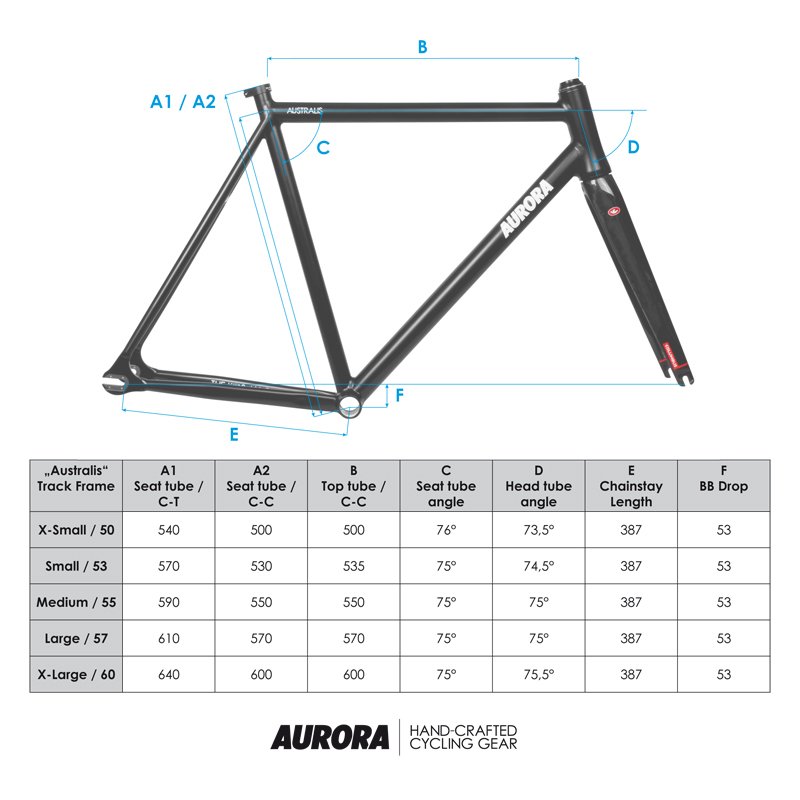 Every AURORA “Australis Keirin” is custom made to order, based on the buyers measurements and individually numbered. merging a classic geometry with modern details and modern materials. Carefully made by a skilled framebuilder in Italy! Options: On request, we offer custom colors and different fork configurations. Just get in touch with us to discus more.